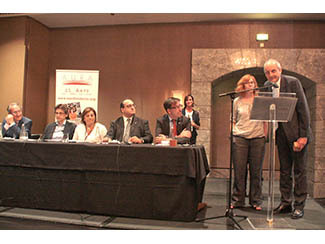 Humana Fundación Pueblo para Pueblo is one of four organizations which have received recognition today Aura Foundation, which grants under the Act Summer of the 25 years of the organization, held in Barcelona. Together with Fundación Pueblo para Pueblo, have been distinguished real estate consultancy CBRE, the company specialized in production and marketing of fresh food Casa Ametller and design studio Casa de Carlota. Marcelo Leoni, Humana Institutional Relations Director, was in charge of collecting recognition. The event was chaired by the heads of Aura, as well as Xavier López, Department of Business and Employment of the Generalitat de Catalunya, and Carlos Domingo, the Agency Coordinating Commissioner of the Council of Barcelona. 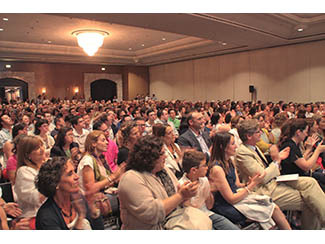 Humana and Aura Foundation are collaborating since 2008. Aura fundamental mission is to help increase the quality of life of people with intellectual disabilities through social and labor inclusion, following the methodology of 'supported employment'. Thanks to the joint work of both entities, Lidia is currently part of the staff of Humana. He is a member of the team of one of our second hand shops in Barcelona. In the coming weeks the incorporation of another person from the program "supported employment" is planned. Previously, Rachel was also part of the team shops. This Act Summer Aura Foundation wishes to acknowledge the work of companies and organizations that have undertaken certain initiatives to improve the training and integration of people with some form of intellectual disability. As explained from the Coordinator Down Catalunya, Aura Foundation "was a pioneer in the Spanish State, and one of the first in Europe to develop the methodology of the organization" supported employment "born in the 70s in the U.S. and Canada; The objective of this methodology is to enable people with disabilities to enter the workforce with the necessary support. " In these 25 years, Aura Foundation has enabled nearly 200 people with intellectual disabilities, especially Down syndrome, to take up employment. Today hundreds of them still active.